The Mi’gmaq have an eight-pointed star that is significant to them. In 1983, a man in Bedford, Nova Scotia came across a Mi’gmaq petroglyph in a wooded area. A petroglyph is a symbol or design carved into the rock on the ground. This petroglyph was an eight-point star – a symbol that is very important to the Mi’gmaq. And it is believed that this eight-point petroglyph is over 500 years old. The eight-point star is believed to be an updated version of the seven-point star; which the Mi’gmaq used to represent the seven districts of their nation. The Mi’gmaq nation grew to eight districts with the addition of Taqmkuk (Newfoundland). And the Mi’kmaq updated the star to eight-points to welcome their brothers and sisters from Newfoundland. The eight-pointed star is often seen today coloured-in in four different colours: red, black, white and yellow. These four colours together represent harmony and unity between the four races of people. The four colours also represent the four directions – white represents north, black represents south, red represents east and yellow represent west. 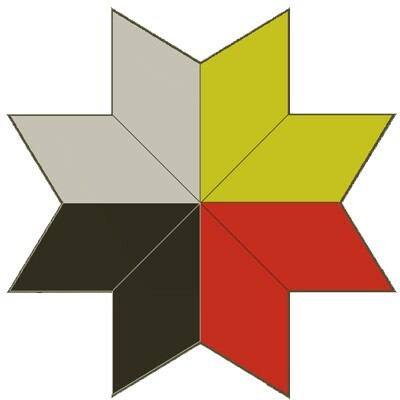 The eight-point Mi’gmaq star is used today not only as a cultural symbol, but also as a design emblem. Many Mi’gmaq artists use the star to decorate their blankets, baskets, drums, moccasins and pretty much anything else you can decorate. For hundreds of years the Mi’gmaq have been celebrating the eight-point star as a symbol for their nation.